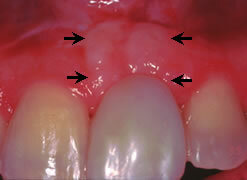 Soft tissue ridge augmentation is often suggested when the patient has a large depression, cleft, or crease in the gum. These deformities can occur as a result of bone loss following the extraction of a tooth, periodontal disease, trauma, injury, wearing dentures, or developmental problems. Such defects can be esthetically unpleasing and/or have a tendency to trap food. 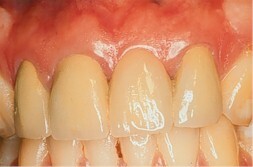 This condition is often treated prior to fabrication of replacement teeth, like, for example, a new dental bridge. The purpose of this procedure is to “build up” the gum tissue, allowing the restorative dentist to create tooth replacements that emerge naturally from the gum tissue with normal cosmetic proportions. This procedure is most often performed on the ridge area associated with the pontic of the bridge, which is the “fake” or missing tooth that the bridge replaces. Esthetically pleasing, natural looking teeth depend not only on the form and shade of the teeth, but also on the shape and contour of the surrounding gums. In other words, if the smile is analogous to a beautiful picture, then the gum tissue could be considered the frame. In areas where teeth have been lost, the bone and gum tissue in the area, lacking the natural support of dental roots, will often shrink and recede over time. If the tooth or teeth were lost due to infection, fracture, or trauma, the damage to the underlying jawbone and gum can be severe. This can result in a depression or concavity of the gum in the affected area. If new teeth are fabricated to the level of the damaged gum, the result will be out of proportion to the adjacent teeth and look artificial or unnatural. The ridge augmentation procedure is performed after a provisional (temporary) bridge has been placed by your restorative dentist. During the procedure, Dr. Wilson removes the provisional bridge, which allows proper access to the ridge directly underneath the pontic. Then, gum tissue from another area of the mouth, usually the palate, is used as a donor, and is placed in a precisely contoured pouch at the pontic site to “plump up” the ridge contour there. 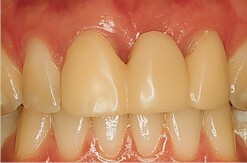 In cases with particularly large defects, other materials may be used instead of, or in conjunction with, the gum graft. When the procedure is complete, Dr. Wilson replaces the provisional bridge. Ridge augmentation is a predictable procedure that can correct the defects caused by bone loss and gum recession in areas with missing teeth. This procedure allows the chance to return the harmonious contours of the gums that existed before the loss of the tooth, creating the opportunity for a natural and esthetic new smile.